Brazilian Street artist DECOLIFE will hold his first London solo show at the Framers Gallery, Fitzrovia, from 1 to 9 March, in collaboration with The Cult House. Titled "As Above, So Below", the exhibition will feature paintings, drawings, sculptures and mosaics. Street artist decolife's first London solo show - As Above, So Below - will take place at the Framers Gallery on Windmill Street, in collaboration with The Cult House. Born in Brazil in 1990, Andre Ruiz de Freitas, aka decolife, has been making art since he was 3 years old, painting on little stones and pieces of wood found on the streets which he would then give away to his friends. He first used drawing as a way to keep a personal diary and started experimenting with graffiti aged 13 when hanging out around the São Paulo skate parks with his friends. 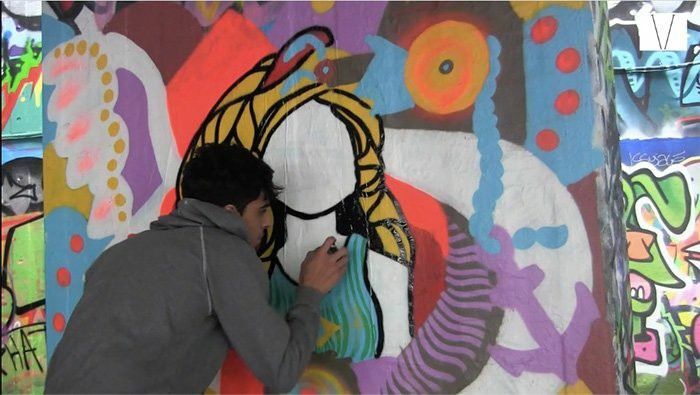 It is around this time that Andre started using the moniker decolife when painting in several cities across Brazil as he took part in street art events around the country. Upon moving to Europe, he travelled across several countries for two years, painting and often using his art to buy food, transport and accommodation. Inspired by the world and the people around him, his art is replete with cultural references and mythological stories, many taken from his own Brazilian culture and upbringing as well as his experiences on the road. Now aged 27 and based in London, decolife’s colourful murals have been a regular fixtures on the streets of Camden, South and East London, getting both public and critical acclaim. Over the last few years, he has built a strong body of work, including paintings, drawings, sculptures and mosaics, which have been exhibited at galleries around the world, from São Paulo (2010) to Istanbul (2013 and 2016). Curated by J A Neto (The Cult House), this is decolife’s first solo exhibition in London.